Cueva de la Peña Colorada (Cave of the Colored Rock) is a remote multi-kilometer cave system comprised of dry and submerged cave passages residing deep in the subsurface world of the Sierra Mazateca, a mountainous region of limestone and dense rain forest in the Oaxaca providence of Mexico. For the last 50 years, cavers from around the world have come to the Sierra to explore the regions extensive caves with the guarantee of finding seemingly endless un-explored cave passage. Cueva de la Peña Colorada lies at the bottom of the deep Santo Domingo Canyon and is believed to be connected to the nearby cave ‘Sistema Huaulta’ which is the deepest cave in the Western Hemisphere. Sump 9 in Sistema Huautla is around 6 kilometers away from the Cueva de la Peña Colorada, and it is thought that the water which is last seen in Sump 9 in Sistema Huautla intersects Sump 7 in the Cueva de la Peña Colorada, before re-emerging in the Huautla Resurgence in the remote Santo Domingo canyon. 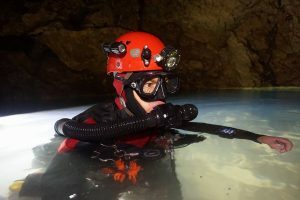 Since it is thought (but not proven) that the Cueva de la Peña Colorada connects into the cave system between Sistema Huautla and it’s resurgence, the primary objective of the 2018 expedition was to continue the exploration of the submerged passage beyond sump 7 in Cueva de la Peña Colorada. 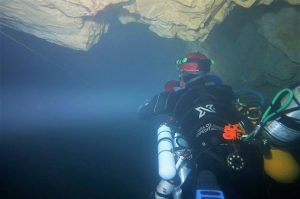 The teams enduring aspirations set the stage for the push divers to discover un-explored dry passage beyond sump 7 or perform an extended range and deep technical dive towards Sump 9 in Sistema Huautla. The last expedition to Cueva de la Peña Colorada was in 1984. 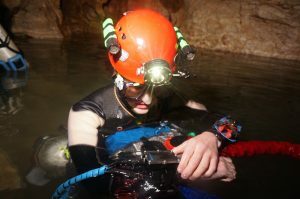 Under the leadership of Bill Stone, Over 200 participants including locals, the Mexican military, and teams of experienced cavers that were up for the task of diving and surveying this cave, mapped Cueva de la Peña Colorada to 7.8 kilometers with 1.4 kilometers underwater. A total of 7.8 kilometers of virgin territory leading into the plateau were surveyed, with 1.4 kilometers of this distance underwater. This was comprised of 7 sumps, the longest of which was 524 meters in length. The expedition established the first ever subterranean camp set beyond an underwater cave passage. The team stopped at a point 55 meters underwater beyond sump 7. Now, 34 years after its initial exploration, a team of 25 caver divers returned to Sump 7 to continue the exploration. A large quantity of equipment was driven down from Texas in two vehicles. This included more than 60 diving cylinders, several hundred kilos of lead, a compressor, tubs of sofnolime, 3 DPVs, rope and caving hardware, underground camping equipment and food supplies. The expedition was based in the small village of Loma Grande, over an hour of driving down small dirt roads from the nearest town. The people here are Mazatec, a very traditional community which still speaks the Mazatec language. The area sees very few visitors and as a consequence the people here are often suspicious of outsiders. Cave explorers are one of the few outside groups which visit the region and despite their best efforts misunderstandings are not uncommon. It’s hard for the local villages to understand that we would give up our free time and spend money just to visit a hole in the ground. This leads to odd rumors about cavers visiting to hunt for gold, buy land or even steal children! Our own expedition became the source of some controversy in the village, and we were thankful to have a native Mexican caver with us who spent many hours reassuring the villagers that our intentions were honest. From Loma Grande it’s an 850m descent to the Canyon floor and then a 40 minute hike up the canyon to the cave entrance. The team’s goal was to place a series of divers in the final sump, Sump VII. To achieve this, the team had cover four diving sections and establish two underground camps. The sumps that required traversing were 2, 3, 4 and 5, all separated by sections of dry passage. Sump 2 is 14m long with a max depth of 4m; visibility would vary between 10m+ and 1m depending on the amount of travel seen; though it would return after a 12 hour period. Sump 3 was 180m with a max depth of 20m. It was a steady descent to 20m over 120-130m, then steep ascent. Typically visibility of around 4-5m, which would take a long time to recover. Half an hour from sump 3 a lagoon is reached which during the start of the expedition was sumped. After the lagoon Camp 1 was established. A further two hours of caving allowed us to reach sumps 4 and 5. Sump 4 is ~55m in length, max depth 11m boulder floor, followed shortly by sump 5 approx a 130m dive at around 5m with a max depth of 10m. A hour of steeply ascending caving with several pitches then allowed us to reach camp 2. Here hammocks were used so that a team of 4 could sleep suspended over the rocky floor. From camp 2 it was only a short distance to sump 7. This sump is at the base of a 70m pitch and the steep walls offered no kitting up location so a ‘porta-ledge’ was carried into the cave and bolted to the wall at the bottom of the shaft. All sumps required re-lining and all pitches were re-bolted. Completing these tasks as well as transporting this equipment, personal diving kit, underground camping kit and the large capacity cylinders required for sump 7 took many weeks. Finally after three weeks in field we were ready for the first push on sump 7. During a 9 night stay in the cave Chris Jewell and Connor Roe made two dives in sump 7 supported by Josh Bratchley and Gareth Davies With visibility around 5m it should have been easy to navigate but the scale of the underwater cave still meant their lights often failed to reach the walls. After picking their way through a boulder choke they descended to 33m and entered a large horizontal passage which matched the description of the previous explorers. Following this passage steadily down they noted several alternative passages but instinctively headed deeper along the largest tunnel. At the lip of a small pot they peered down into the depths before descending to a rock and gravel floor at 51.5m depth. A little further ahead however the large passage stopped abruptly in a pile of well consolidated boulders jammed against each other. Retracing their steps whilst decompressing they scoured the walls for the missing way on but nothing could be found except the previously noted side passages which they decided to leave for the next day. Unfortunately, there was no going passage beyond sump 7 and the water flow appeared to be static. This might mean that the water enters the cave from another location to relieve flowing water pressure from Sistema Huautla. It is without indecision that Cueva de la Peña Colorada Floods substantially after a period of rainfall but where is the water coming from? The Huautla Resurgence Cave discharges incredible amounts of water and the signs are apparent that Cueva de la Peña Colorada follows suit to the hydrology of Sistema Huautla.